In GIDEON’S SWORD, Preston and Child’s introduction of their brilliant new character, master-thief-turned-assassin Gideon Crew, is circumvented by a middling plot, resulting in a fun, but ultimately forgettable thriller. When he was just twelve years old, Gideon witnessed the death of his father, a celebrated mathematician who was accused of treason. Over a decade later, his dying mother informed Gideon that his father was framed; his death was an organized hit. She makes her son promise to avenge him, and so, with this new purpose in life, Gideon plots and executes the perfect one-man mission of vengeance. But a shadowy, quasi-government organization is watching. They have big plans for Gideon; and Gideon soon discovers he has no reason to decline their clandestine mission. He has just one year to live, which means he’s a man without fear – whether it’s today or tomorrow, or in that designated year, Gideon Crew is going to die; which makes him the perfect operative. Alas, that ‘clandestine mission’ is undercooked; a Chinese official is supposedly defecting to the United States and carrying plans for a secret weapon. Crew’s mission is to ensure those plans fall into the hands of his employers and no one else. Of course, things don’t go to plan, as a brilliant Chinese assassin, The Nodding Crane, has arrived in New York to ensure Gideon’s mission fails. And while there’s plenty of fantastical action and adrenaline-fueled set-pieces in what follows, there’s not much here that thriller aficionados haven’t read before. With one year to live, and each Gideon Crew novel taking place over the course of a month, his overarching story is a brilliant hook, and guarantees a sustained readership over the course of the series. 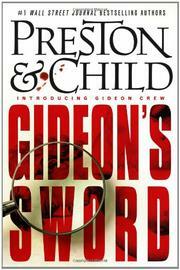 GIDEON’S SWORD is a perfectly adept thriller in what has the potential to be a brilliant long-running series.